£100 deposit will secure booking, full payment required 8 weeks before arrival date.Payment by bank transfer please. 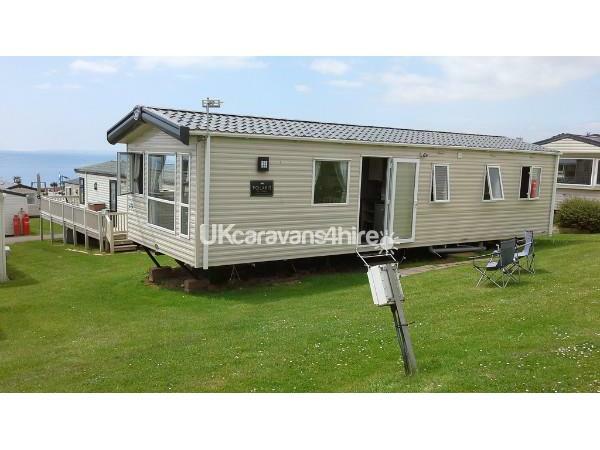 You will not be disappointed with our modern caravan for hire on Devon Cliffs. 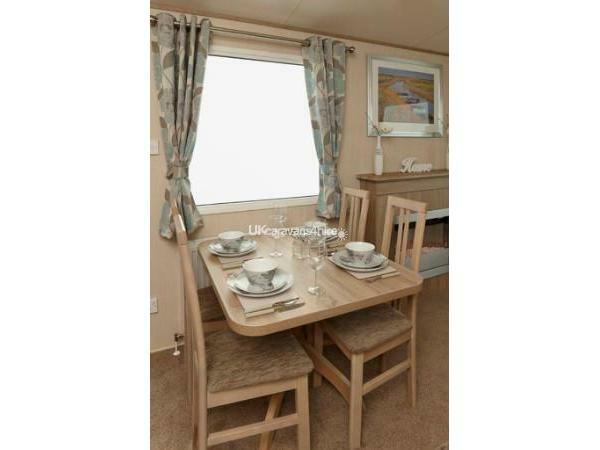 It has double glazing and central heating throughout, with a fitted kitchen, shower room and three bedrooms. 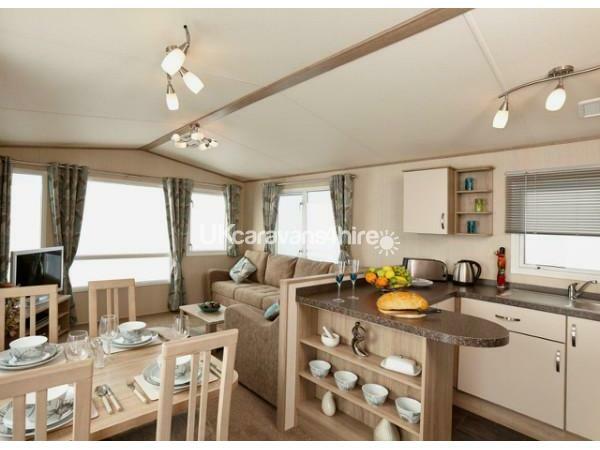 On entering the caravan, you will immediately see the kitchen area, with full sizes cooker and four gas burners. 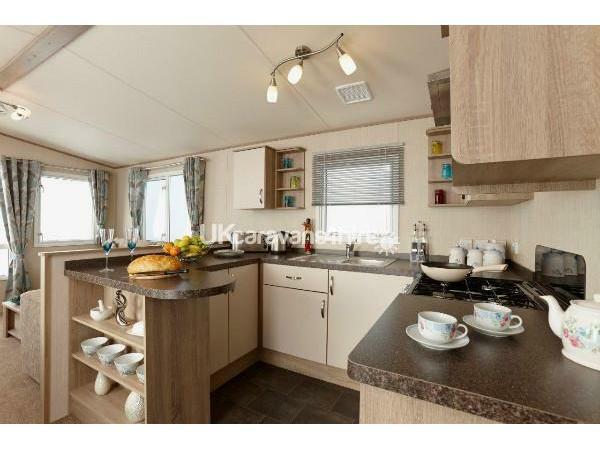 There is an under counter fridge with freezer compartment, kettle, toaster, pots and pans, cutlery and crockery in the ample storage units. 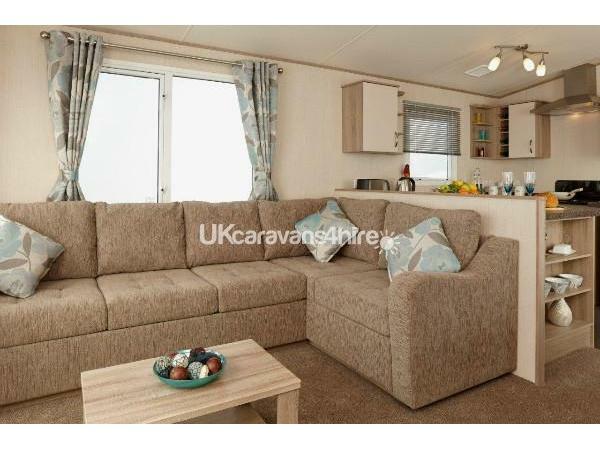 There is a separate dining area, alongside a comfortable seating area, and electric fire, TV/DVD combi, and coffee table. Through a useful separating door, you will find the shower room with large shower cubicle and power shower, wc and basin, with storage shelves and towel warmer. Next is a separate cloakroom with wc and wash hand basin. The master bedroom has a king size bed, wardrobe and sea view. There are two further bedrooms with twin single beds in each, which could be pushed together to form doubles. We can supply entertainment passes at an extra cost. We do not allow pets or smoking inside our caravan, although an ashtray is provided for outside use.